The All-India CPI-IW for November, 2018 remained stationary at 302 (three hundred and two). On l-month percentage change, it remained static between October, 2018 and November, 2018 when compared with the increase of (+) 0.35 per cent for the corresponding month of last year. The maximum downward pressure to the change in current index came from Food group contributing (-) 0.14 percentage points to the total change. At item level, Coconut Oil, Milk, Banana, Apple, Chillies Green, Brinjal, Cabbage, Cauliflower, French Bean, Gourd, Green Coriander Leaves, Methi, Palak, Potato, Radish, Tomato, Petrol, etc. are responsible for the decrease in. index. 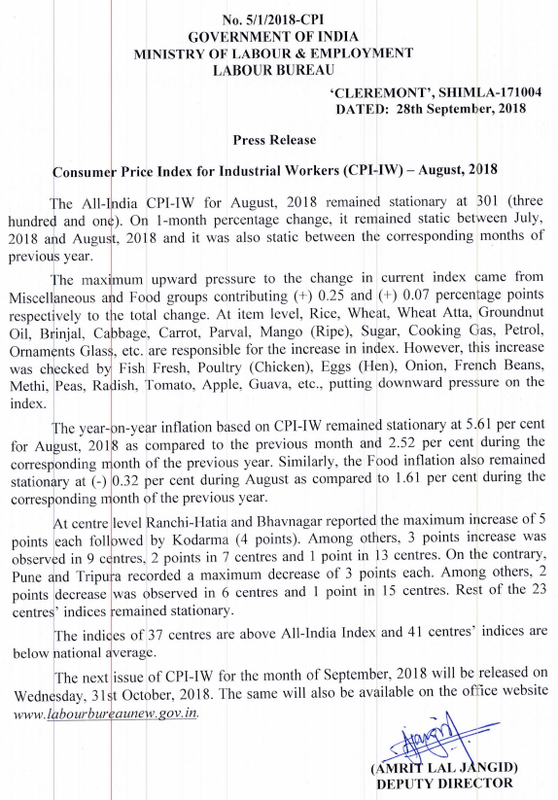 However, this decrease was checked by Rice, Wheat, Wheat Atta, Arhar Dal, Eggs (Hen), Fish Fresh, Goat Meat, Onion, Cooking Gas, Medicine (Allopathic), Cinema Charges, F lowers/F lower Garlands, etc., putting upward pressure on the index. The year-on-year inflation measured by monthly CPI-IW stood at 4.86 per cent for November, 2018 as compared to 5.23 percent for the previous month and 3.97 per cent during the corresponding month of “the previous year. Similarly, the Food‘inflation stood at (-) 1.57 per cent against (-) 0.95 per cent of the previous month and 3.91 per cent during the corresponding month of the previous year.